The question that I get more often than any other is “can I mix bottle glass?” The answer is yes, with caveats. I wish I could claim credit for the technology, but the CWC.org folks figured all of this out for us sometime in the late ’90’s. You can read the white papers on their website. The long and short of it is, it all depends on temperature and glass particle size. What you see here is one week’s worth of testing of different glass colors, temperatures and particle sizes. 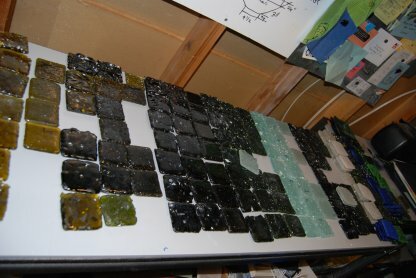 I am working out the last few bugs on a line of recycled glass tiles. This is about a third of my test firings. It’s hard to see the stacks and stacks on the right hand side of the photo. Tile photo’s coming up. Stay tuned. If you enjoyed this post, you’ll LOVE my newsletter! Sign up now and you won’t miss a thing. My name is Jaci and I live in Brazil. I love your experience with recycling glass. I look for a easy way to recycling glass bottles localy and so get any new works place for a comunit of people who used to get money througt sale used paper or oder recycling material. They dont have to much money to invest but people who need some work. You can help me wiht some ideas?